1. Protect your lower back and neck. 2. You will elongate your muscles, strengthen them and get more air. 4. You will learn to swim much faster with no effort. **Thousands of people join the WEST online program each month all over the world and Save thousands of dollars by swimming and not going to the doctor. The WEST technique was developed over 17 years ago in order to relax the body and treat neck and back problems, as well as traumatic accidents. Recently, we can see a clear trend in the athletic world of adjusting the swimming technique to one’s body shape, physical abilities and even lifestyle. 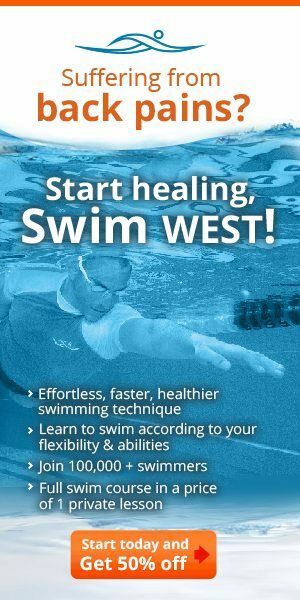 The WEST swimming technique is based on those 3 factors solely, and modified to every individual with personal and specific care. 1. In this course you will learn and improve your freestyle swimming technique. a loose and easy swimming technique. understand exactly what you should do. in order to protect your joints and elongate your muscles. you practice 3 days, it will take you only 5 weeks. You don’t need to think!! We have done the thinking for you !! In the course you have 5 different workouts each workout should be repeated exactly 3 times. You need fins and goggles. Over 45 lectures and 1.5 hours of content! Swim easily 200 m freestyle with much less effort. Whats your right stretching depth in order to protect your neck, lower back. Swim less strokes in each lap. don’t take this course if you are afraid of water and have hydrophobia.